I had no idea about Dreams' removal from Steam until I looked for the relevant Reddit thread, but safe to say of course it's unfortunate its rights are in the hands of someone like that. 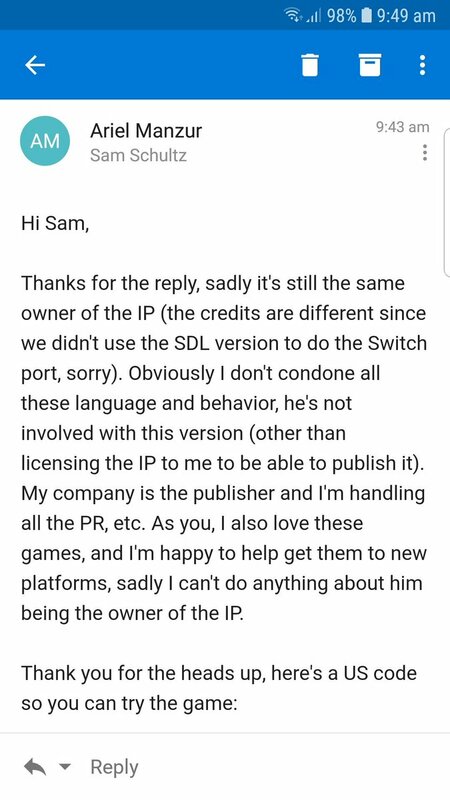 With respect to this release, not that I should or would spend US$10 on a marginally more convenient copy of a game I can play for free, but would its purchase just stand to benefit said rights holder, or is it unlikely he'd get a cut beyond whatever Lone Wolf paid him for the license initially? If it's even possible to speculate on such things, that is. This is very interesting since seeing it from another source. I'd surely buy the 'whole' series for that price but for some odd reason only Keen Dreams made it on Switch.. as far as I know. I'm assuming that it being the only episode Bethesda doesn't retain the rights to (aside from maybe Episode 6?) is why it's had a resurgence of late, and the source code release and such. The rest are still unlikely to make a reappearance I'd guess. Does anyone know how the rights came to be under Hard Disk Publishing or whoever it is that does now have them? I'm assuming just a chain of acquisitions from Softdisk after they closed up shop? Huh, interesting, this was rather unexpected. It looks like Commander Keen has finally been ported to the Nintendo, even though, this is Keen Dreams and not Keens 1-3 (get it?). All I know is that in 2014 an individual named Javier M. Chavez bought the rights to Keen Dreams from Flat Rock Software after a more or less successful indiegogo campaign. Here's the PCKF thread. I suppose Flat Rock Software owned whatever was left of Softdisk Publishing at that time, as they also released the full source code for Hovertank 3D and all six Catacomb games the same year. I can only guess that Mr. Chavez decided to do business under the name Hard Disk Publishing later on. I have no doubts that Javier is the guy behind Hard Disk Publishing, that's for sure. David Gow did the work on porting Keen Dreams to modern platforms, for the since-removed Steam release. For the (relatively) short period it was back on Steam via Nightdive Studios, Ryan C. Gordon was working on this same port before its re-release. I really like the porting job they did. The music, while a bit bland, goes a long way towards making the game feel complete. I wonder if there's a way to activate the cheats. I emailed the dev and asked about the possibility of support for mods. Im happy you enjoyed the release. There was some talk about adding a map editor, shared levels, maybe co-op mode, this is more difficult to achieve on a console due to restrictions in user generated content and network features in general, but we are considering depending on how the sales go. The idea of a Keen game with a built-in level editor and CO-OP is really tantalizing. How would co-op in Keen even work? How would co-op in Keen even work? Ever heard of Commander Genius? BTW I'm really surprised that they added music in this! I was about to ask if they actually have added something new or changed something and they did. From that video I've watched, I don't think it fits well Keen Dreams. I can't describe exactly what's wrong with the music. Maybe the drums are bad and the melodies are mediocre. It's not keenish enough or it's not my taste. In my opinion such game should have some 8-bit/16-bit vibes in the tunes, even if they contain more instruments than that era. Also, it's amusing to see people asking why only Keen Dreams was released and not the other games. Obviously most people who don't play regularly Keen don't know who owns which keen and that fragmentation is bad. Umph! You've hit my "offense taken" button! To be honest, the "who owns what" situation is very unclear to many and it's not really funny when it comes to what we know and what not. I wasn't referring to you. I was referring to some opinions on twitter I've red from people who are not on this forum. The music's a bit odd but I think it fits well enough. I encourage everyone to buy this new release because it's clear that someone who actually cares is working on an official Keen product for the first time in 25 years. I supported that guy back in the steam days, but he screwed up then. I already got the game and at that price I don't feel like buying it again, unless there is a new episode at least. I'd rather support people here for the awesome mods.